Because beautiful, vibrant, delicious pizza has zero need of dairy. 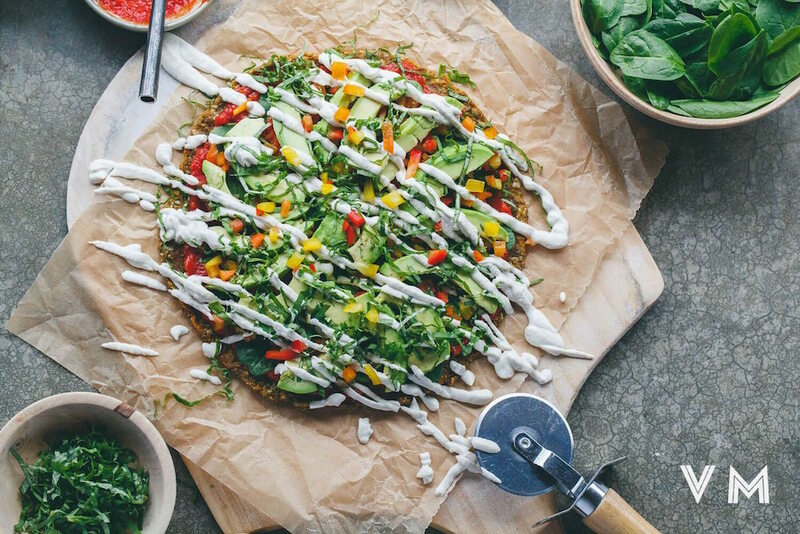 Get your vegan pizza game on with these delicious, nourishing & inventive plant-based recipes. We love spelt crusted pizzas! It's our go-to recipe when making yeast-dough bases. Paired with beetroot & aged vegan chèvre, this rustic recipe sounds like perfection. This recipe shakes things up a little, with a pumpkin, almond & chickpea flour base, which is then slathered in a creamy green herb and cashew sauce. If you're in the mood for greens, this pizza is for you. This recipe uses nourishing whole wheat flour (which is much higher in protein and fibre than refined white flour), and is topped with creamy kale pesto + chickpeas, seeds and extra greens. It may be healthy, but it sure sounds delicious too. We've made this recipe a few times now and can't get enough of it! In fact we often double it, and keep half to eat just on its own as biscuits the next day. Sometimes we add some pumpkin in too (because pumpkin can only make things better, right?). This base is a nice alternative when you don't feel like traditional style pizza, and is super healthy, with its combination of sweet potato, oats & almond flour. Peanut-buttery pad thai and pizza rolled into one? Count us in! Bean sprouts, tofu & tamari probably aren't toppings you'd find on a traditional Italian restaurant menu, but hey, why not get a little trans-cultural? We sure love us some lentils. They're full of plant-based protein, iron and other minerals and vitamins. So when we came across this lentil pizza crust we knew we had to add it to the list. Sometimes, you just want a plain old margherita pizza. And when that happens, Vedged Out have got you covered with their recipe for homemade melty, stretchy Moxarella. With ingredients like kabocha squash, kale, mushrooms, walnuts and marinara sauce, this is the perfect pizza for autumn months. We really are straying away from the traditional here aren't we? This beautiful deep-dish creation is arguably more like a pie than a pizza, but hey, Anthea counts it as a pizza so we're rolling with that too. Plus, it's got falafel, beet hummus and tahini cheese sauce? Come on now, this recipe had to be included. Following our new found appreciation for raw vegan cuisine (after enjoying an incredible raw vegan dinner at Melbourne restaurant Shoku Iku), we wanted to leave you with these recipes. The first is from Vegan Miam: a pumpkin, flax & sunflower seed base, topped with tomato sauce, vegetables and cashew cheese drizzle. The second image is from Shoku Iku: a sprouted buckwheat, flax & veggie pulp crust, topped with a green pine nut sauce and zucchini ribbons.